This is parenting like a guard. 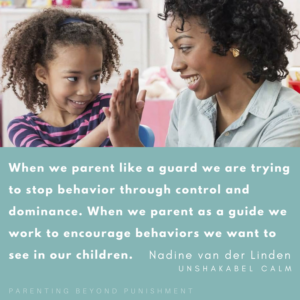 It is inflexible, rules-based parenting that requires punishment when a child doesn’t behave. The punishments often escalate and may be harsh, cruel even. In the worst case scenario, a child raised in a controlling environment will comply due to a fear of being beaten but will not do anything other adults say if there is no risk of being hurt. The most anti-social children are often parented in this way. They don’t care about the meaning of the rules set; instead they decide whether to comply based on whether they will get hurt. Controlling parenting practices are also correlated to poor mental health in children and youth. Being able to hold your child’s perspective is essential to being a guide. It helps parents understand how best to help their child. It helps us identify that difficult behaviors are often related to emotions or skills deficits. This doesn’t mean we accept all behaviors as ok, it means that we understand that there is a meaning to whatever behavior we are seeing. Children love receiving genuine praise and being noticed. If they feel you genuinely care about them rather than that you are trying to control their behavior, they are more motivated to work for you. Children are less receptive to praise that functions to control behavior such as “aren’t you a good boy for sitting up straight today?” A genuine “I can really see you are listening, and that makes me feel good” is more effective. Nadene van der Linden is a clinical psychologist in private practice. Nadene is the author of the much loved Tales from the Parenting Trenches: a clinical psychologist vs motherhood. Join the Unshakeable Calm Facebook group today. Science based tips for calm and confident living. Republished with permission from Parent Co.